This paper presents an empirical examination of economic and institutional development. 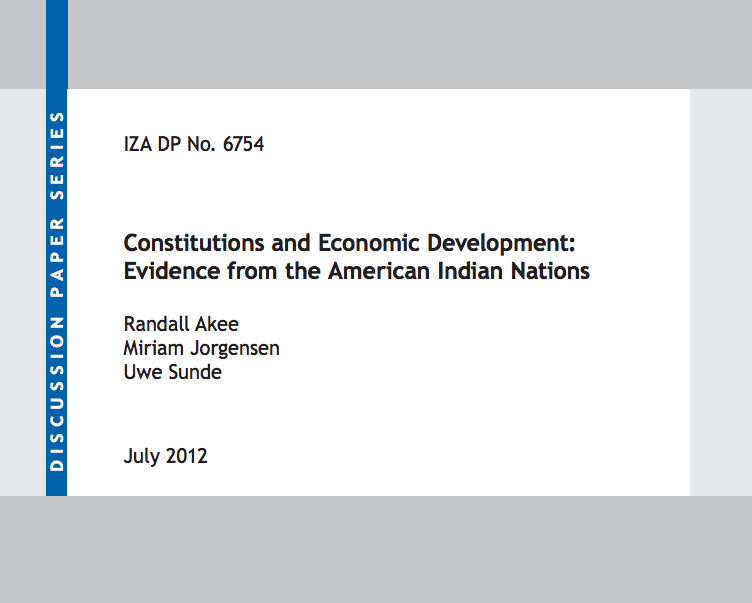 Utilizing a novel data set on American Indian tribal nations we investigate how constitutional design affects economic development, while holding the broader legal and political environment fixed. Instrumental variables regressions, using the party of the U.S. President at the time of the initial adoption of tribal constitutions as an instrument for constitutional design, indicate that parliamentary systems (versus presidential) have a strong positive effect on economic development, while ordinary least squares regressions of current economic outcomes on parliamentary systems of government show no effects. Robustness checks suggest that the results are not explained by differences in other institutions or geographic characteristics. Additional results provide some suggestive evidence that the effects may operate through channels that are typically associated with parliamentary systems, such as larger public employment, and more equitable income distribution.